A first-half Michael Ballack goal separated Chelsea and Reading at Stamford Bridge, in a game which never really got going but once again resulted in three points for Avram Grant’s side. With Arsenal winning against Newcastle 24 hours earlier, and Manchester United going on to win 2-0 against Portsmouth, Chelsea needed a win to keep pace with the table-toppers. Reading stood in the way, but with the Royals going through a dismal run of form, it didn’t take long for the Blues to prove their superiority. 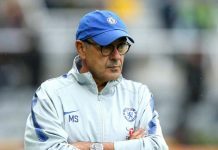 Chelsea started brightly and after Ballack had a tame free-kick saved in the opening six minutes by Reading ‘keeper Marcus Hahnemann, the American shot-stopper was called in to action again soon after. A Joe Cole shot heading for the top corner was superbly tipped away by Hahnemann, who then had to spread himself well to stop an on-rushing Shaun Wright-Phillips a few minutes later. Pressure on Reading’s goal continued and Cole had a corner cleared off the line following a rare Hahnemann error. Steve Coppell’s side could do nothing to stop what happened next though. Just after the half-hour mark, a pin-point cross from Paulo Ferreira-in the starting XI for the suspended Juliano Belletti-was met by a powerful header from Ballack. The ball sailed past Hahnemann and into the back of the net for 1-0. What made the goal even sweeter was the fact that Ballack out jumped public enemy number one as far as the Bridge is concerned, Stephen Hunt, to score the header. Hunt was roundly booed all evening by the Blues’ faithful for his rather large role in the fracturing of Petr Cech’s skull last season. With no more incidents to mention, both sides went in at half-time with just the single goal between them. After the break, the trend of attacking football by Chelsea continued. In a carbon-copy of his first-half chance, Wright-Phillips cut through the Reading defence like a hot knife through butter, but again Hahnemann read the move and got down low to block the shot. The next chance fell to new signing Nicolas Anelka, who got off the mark with a goal against Wigan last weekend. Unfortunately this time he fell short of scoring, as he headed a fine Wayne Bridge cross powerfully down, but too close to Hahnemann. Reading rarely threatened in truth, and any half-chances were easily dealt with by Cech. After a Chelsea change, Claudio Pizarro on for a poor Florent Malouda, Reading’s John Oster curled a free-kick over the bar, but Cech looked to have it covered. The game began to peter out as the final whistle approached, but there was time for Steve Sidwell to get a few minutes against his former side, the midfielder coming off the bench for Wright-Phillips. When the 90 minutes plus injury time were up, the win was confirmed, making it nine in a row at home and equalling a club record. More importantly, Chelsea kept pace with United and Arsenal despite not playing as well as either of the two clubs. I think the best phrase in this case is one we seem to hear a lot after narrow wins. Job done. Chelsea: Cech, Ferreira, Alex, Carvalho, Bridge, Wright-Phillips (Sidwell 85), Makelele, Ballack, Joe Cole, Anelka, Malouda (Pizarro 76). Subs Not Used: Cudicini, Sinclair, Ben-Haim. Reading: Hahnemann, Murty, Cisse, Ingimarsson, Shorey, Oster (Matejovsky 81), Harper, Hunt, Convey (Rosenior 85), Lita, Doyle. Subs Not Used: Federici, De la Cruz, Bennett. Previous articleWILL AVRAM HAVE THE LAST LAUGH?